Giggles is SOCKS ONLY facility. Please bring your own grip socks or you can purchase at the front desk. Giggles is an indoor playground that provides a safe, clean, educational and entertaining environment for children. It also is a wonderful place to throw your child's birthday party. Giggles is designed for children between the ages of 9 months to 6 years old. While your children are enjoying the playground, parents and caregivers can easily keep an eye on them while socializing with other adults, and enjoying a fresh cup of complimentary premium coffee. You are also welcome to bring your own food and snacks. All food must be kept inside the eating area at all times for safety and cleanliness. Microwaves are accessible for your convenience. Giggles is the perfect place to throw a fun and memorable party for your child. 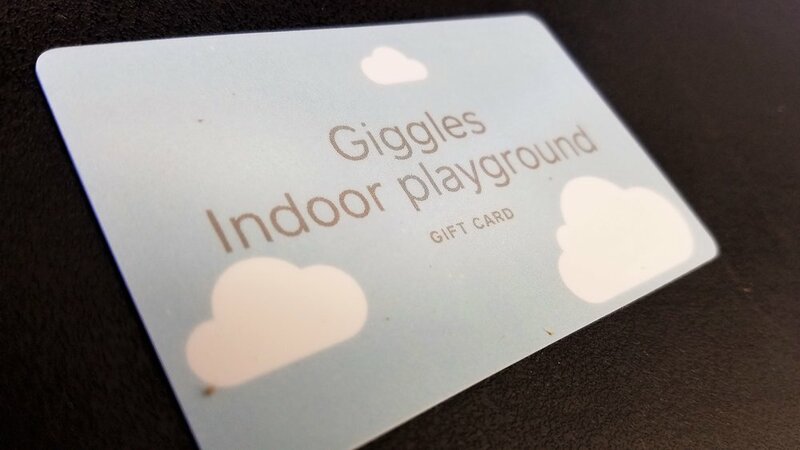 Plastic Gift Card is available at the store.